Cheering Bang Stick is the best-selling noise maker. Our newest and novelty inflatable sticks are popularly used in a variety of events. Sports fans around the world love these marketing impression. 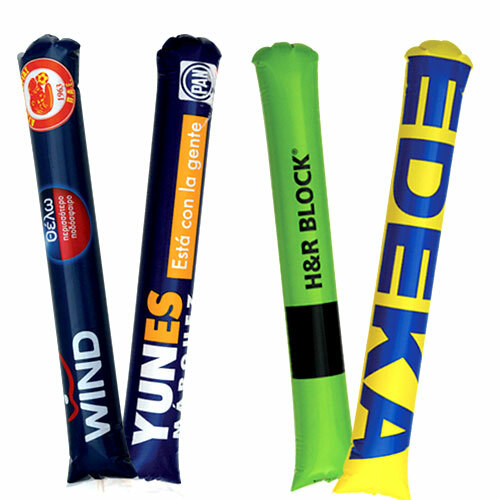 Bang sticks, made from Polyethylene and can be produced with biodegradable PE for an even more eco-friendly promotion. Bang sticks become the ideal promotional product for gifts at basketball, football, baseball, hockey and other sports games. Cheering Bang Sticks be used for advertising promotion. Wouderful acclaim tools for sport events. It has a straw for easy inflation, having High Quality Gravure Printing, can be packaged in singles or pairs. Color logos can be printed on one side or both sides. Customers’ logo and design are welcome. Final price depend on your Quantity and LOGO Printing Colors.